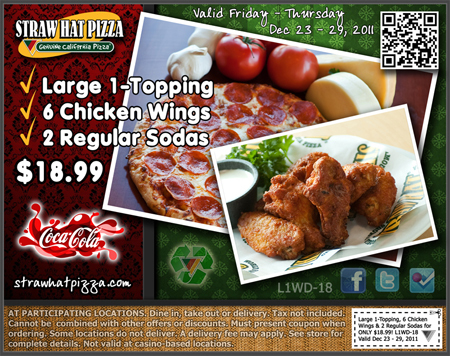 Straw Hat Pizza: Dinner Deal! AT PARTICIPATING LOCATIONS. Dine in, take out and delivery. Cannot be combined with other offers or discounts. Tax not included. Must present coupon when ordering. See store for complete details. Some locations do not deliver. A delivery fee may apply. Some locations do not serve pan pizza. Not valid in casino-based locations.